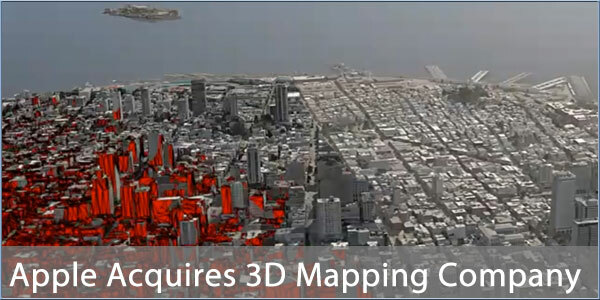 Apple has acquired 3D mapping company C3 Technologies in a move which many are hoping means their amazing 3D mapping tech will be coming to the iOS platform. The image above shows the quite amazing detail that can be created in the 3D rendered view. C3 technologies use aerial photography and laser/radar to create the 3D model. Nothing demonstrates this quite as well as a video so take a look at this. C3 Technologies uses some impressive technology to create its 3D mapping based on de-classified missile targeting software. But, whilst it was known as early as August that they had been bought, the identity of the mystery buyer had until now remained a mystery. Coming on the back of Apple's earlier purchase of 3D mapping outfit Poly9 last year and and the mapping company Polybase in 2009, speculation will now be focussed on just what Apple are planning to do with all this expertise. The demo video's look rather nice however I can't see this making a useful navigation app, in the same way that the standard maps app at the moment isn't great for navigation. It would make a nicer Maps app that's for sure, but I'm, not convinced the realistic images are any good for navigation. The acquisition of this mapping company by Apple is their attempt to remove any Google apps off their devices. Steve Jobs and Apple both hate Google and want nothing to do with them. It has nothing to do with a navigation app. Sadly, Steve Jobs is no longer able to do that.